The British Royal Mint has released the 2009 UK Britannia Four Coin Silver Proof Set which includes a £2 coin, a £1 coin, a 50p coin and a 20p coin. Making this collection unique is the fact that for the first time an image of Britannia is accompanied by a portrait of the current Queen on a silver proof set. A mythical figure, Britannia was first introduced on British coins in 1697 when she replaced the walking lion figure traditionally used before that date. She has come to symbolize the strength of Britain. 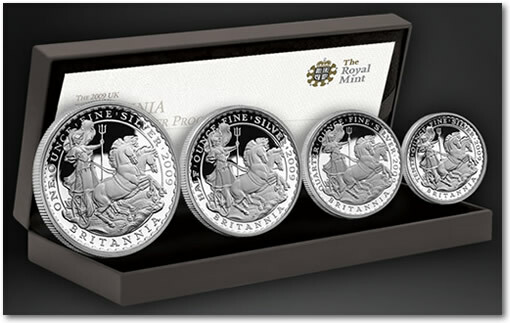 The reverse or "tails" side of these coins showcase a version of Britannia designed by Philip Nathan, which was used originally for coins in 1997 when the silver proof Britannia family made its debut. It was inspired by the famous 1st century AD warrior queen Boudicca, who was known for leading a daring revolt against the Romans. This particular portrayal of Britannia emphasizes her power and association with the sea. It features her standing proudly in her chariot, drawn by two magnificent horses as they race along the sea. The obverse of the coins features a portrait of Queen Elizabeth II, as designed by Ian Rank-Broadley. All four coins in the set are struck in proof quality from .958 Britannia silver. Containing 95.8% silver and 4.2% copper, this alloy was first used during the recoinage of King William III in 1696. The alloy exceeds the precious metal content of the more traditionally used sterling silver. The four coin set consists of a 40mm £2 coin, a 27mm £1 coin, a 22mm 50 pence coin and a 16.5mm 20 pence coin, containing one full ounce, a half ounce, a quarter ounce, and a tenth ounce of pure silver, respectively. It sells for £125.00 (~$209 US) and comes housed in a walnut-veneer presentation case complete with a Certificate of Authenticity guaranteeing the issue limit of just 2,500 Sets. 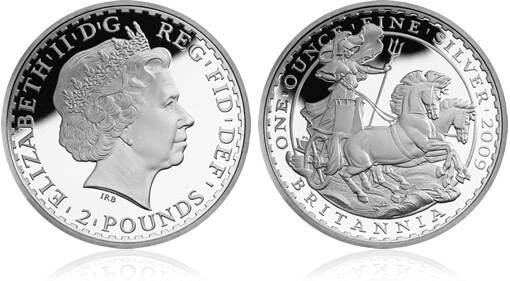 The £2 one ounce silver coin is available separately for £52.95 while the 20p 1/10 ounce silver coin sells for £22.50. The £1 coin as well as the 50p coin are only available in the complete proof set. To purchase these coins, or for more details, go to www.royalmint.com.